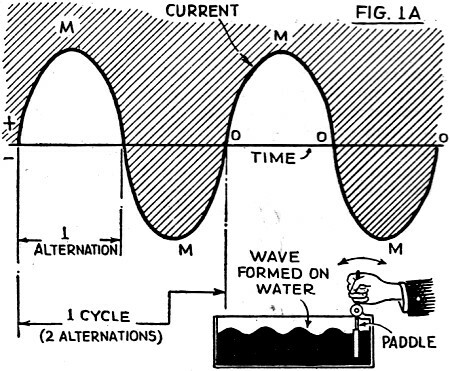 Author George Shuart published this first of a multipart series of basic electronics theory in the September 1935 issue of Short Wave Craft magazine. He began with alternating current and the familiar analogy to various forms of mechanical oscillations, specifically, waves on the surface of water when agitated in a sinusoidal manner. Translating a point on a rotating disc into a time-varying plot is also demonstrated. His transformer analogy of voltage and current ratios as a function of power conservation between primary and secondary windings uses a hydraulic system that exploits a mechanical advantage. Fig. 1A - An analogy for wave motion and how alternating current reverses from positive to negative many times a second. Fig. 1B - A hydraulic analogy for A.C. Fig. 2A - The production of a magnetic field about a simple A.C. electromagnet. Fig. 2B - The interlocking magnetic field produced in the A.C. transformer, and which links the secondary with the primary. Fig. 2C - A simple method for recording the fluctuations or periodical changes occurring in an alternating current by drawing a slip of paper along under the recording needle, which is attached to the vibrating armature or reed. Fig. 2D - A very interesting analogy for the A.C. transformer, in which the voltage applied to the primary may be changed to a higher or lower voltage in the secondary. In the hydraulic press shown above, a pressure of 50 pounds exerted by the small downward moving piston at the left, is eventually transformed into an increased pressure of 250 pounds in the large cylinder at the right. Fig. 3 - Mechanical analogy of the action taking place in an A.C. transformer. 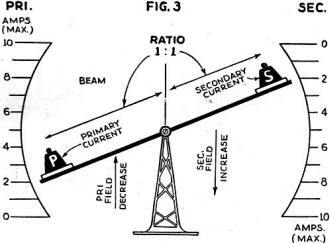 As the secondary current represented by the weight "S" increases, the primary current also increases. 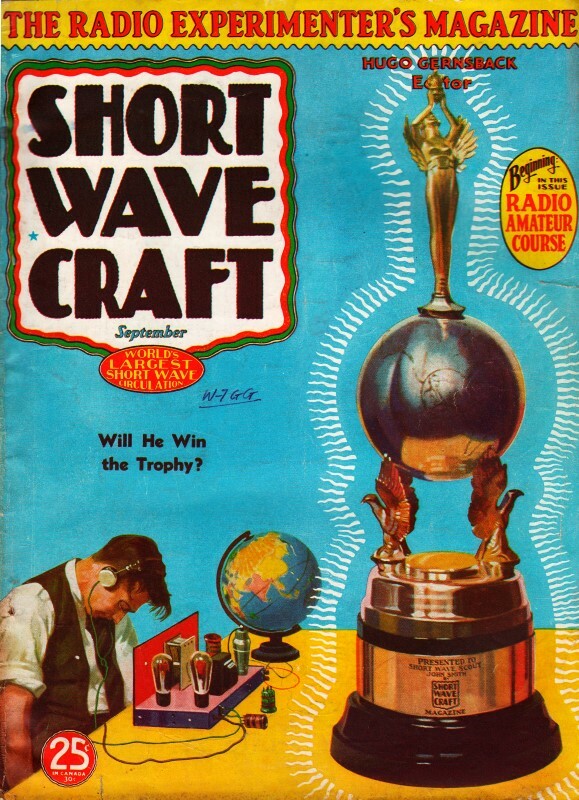 After reading several thousand letters received from short-wave amateurs, including both licensed hams as well as prospective hams, the editors concluded to follow the suggestion made in many of these letters to the effect that a course in short waves, from the ham angle, would be very welcome and useful. It will be especially prepared so as to gradually carry the student along through the elements of oscillatory circuits and the how and why of the vacuum tube. In order to understand the workings and phenomena of various radio circuits, it is essential that the student have a thorough knowledge and understanding of alternating current (A.C.) electricity. There is nothing so difficult about A .C. if the student forms a clear mental picture of just what happens in the production of this type of electricity. Most of us are familiar with the operation of direct current which is a steady uniform flow of electricity in one direction. A.C., on the other hand, is unlike D.C. inasmuch as the direction of flow is not uniform or constant. In Fig. 1 we have a straight line which is known as the time line. The waving line drawn along the straight line represents alternating current. Starting at the left of the line we find that the current is zero; as we proceed to the right along this time line the current builds up gradually until it reaches a maximum and then decreases gradually to zero; it then builds up in the opposite direction to another maximum and finally decreases to zero again. This represents one complete cycle in which the current has gone through two alternations. In Fig. 1 two complete cycles are shown. If this were to take place in the period of one second it would be said to have a frequency of two cycles. Hence, the term 60-cycle A.C. which is commonly used for designating the type of electricity used in home service, which means 60 complete cycles or 120 alternations per second. The frequency of alternating current is the number of times a complete cycle takes place in a period of one second. To obtain a clear picture of the operation previously described let us refer to Fig. 1-B, which shows the hydraulic analogy. We have a cylinder pump with a complete loop through which a liquid can be pushed. The piston of this pump is driven by a motor or else by hand. If the drive wheel "A" is turned to the left the piston moves to the left, forcing the liquid through the tube "L," in one direction and causing the indicator at the top of the loop to indicate that pressure is being exerted upon it. When the piston is to the extreme left and the motor-driven disc has rotated through 180 degrees, the flow stops, allowing the indicator hand to return to zero, due to the two centering springs which are attached to it. This indicates half of a cycle. Then, as the motor is rotated through the remaining 180 degrees, the opposite of the previously mentioned action takes place, causing the vane or indicator to register a maximum in the opposite direction, and then return to zero after that half of the cycle is completed. Associated with alternating current we also have voltage or pressure, termed E.M.F. or electromotive force. This voltage is alternating in the same manner as the current and at the same frequency. The chief value of alternating current lies in the fact that it can be transmitted over long distances at high voltages and low currents, permitting the use of small wire and greater saving in cost, and at intervals stepped down to lower voltages with high currents through the medium of the transformer. The action of the transformer, briefly explained, is to step the imposed voltage up or down depending upon what the case may require. If we connect a coil of wire such as shown in Fig. 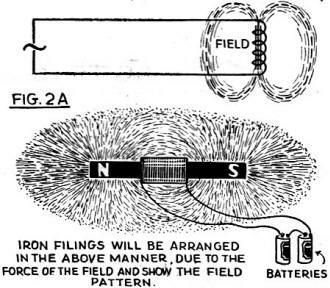 2A, preferably one that has an iron core, to a 110-volt 60-cycle A.C. source, or any A.C. generator for that matter, we find that the continuously alternating current flow through the coil induces a magnetic field (radiated lines of force) about the coil, see Fig. 2A. This field builds up and collapses twice for every cycle of the imposed alternating current. Now. 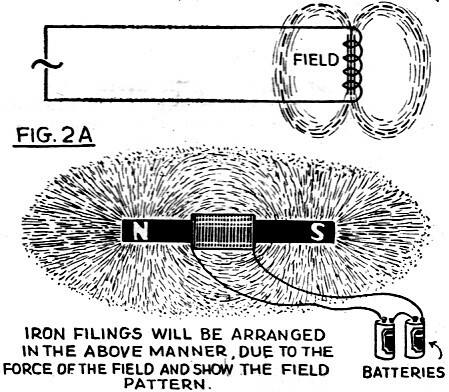 if we were to place another coil in close proximity to this coil and one of similar design, we would find that the fluctuating magnetic field in the one coil would induce an E.M.F. or voltage in the added coil; this is known as induction. The entire theory of a transformer is based upon this fact and operates on a plan or principle of mutual induction. If the two coils shown in Fig. 2B have the same number of turns and we impose a potential of 110 volts upon the primary, then theoretically we will have 110 volts across the two terminals of the secondary. No current will flow in this secondary until it is either short-circuited wholly or in part, either by connecting the two terminals together or by inserting between the two terminals a resistor. The current which will then flow depends upon the resistance of the short circuit. This resistor is known as the load circuit. If the load circuit is purely resistive, that is noninductive and non-capacitive, Ohm's Law can be applied in the same manner as when solving direct current problems. If no load is connected across the secondary terminals of the transformer, the only current which will be flowing in the primary will be that amount which is necessary to energize the primary circuit and is usually termed the magnetization current. But, just as soon as we impose a load upon the secondary and cause a current to flow in this circuit, which incidentally flows in a direction opposite to the current flow in the primary; we have an increase in the primary current. In order to obtain a clearer picture of just what happens in the primary and secondary of a transformer we offer the mechanical analogy shown in Fig. 3. The two outer scales marked from 0 to 10 in steps of two units, represent the amount of current in either primary or secondary that would be shown on an ammeter. The horizontal or tilting beam represents the fields of the primary and secondary moving in the opposite direction. The ratio of the transformer is 1:1. The field of any coil is analogous to the current flowing through it. Weight "S" represents the secondary current; weight "P" represents the primary current. As weight "S" moves down the scale it increases the field or lines of force of the secondary which, because they are analogous to the current therein, are in opposition to the field already in the core and tend to decrease it, thus raising weight "P," which is the primary current, upward until the platform becomes horizontal, indicating the same amount of primary current as secondary current. When the weight "S" is opposite one zero mark, weight "P" in this analogy, will also be opposite the other zero mark. However, as previously mentioned, there is always a slight amount of current flowing in the primary circuit in order that it may be energized. Always remember that the current in the primary and secondary of the transformer are opposite and that the fields are also opposite. In all cases, though, it is important to remember that the frequency of the alternating current in the secondary is absolutely the same as the frequency in the primary circuit. So far as we have considered the two coils, the primary and secondary windings are identical and therefore the voltage in the secondary circuit will be the same as the voltage impressed upon the primary. However, if the number of turns in the secondary coil is one half the number of turns in the primary coil, the voltage will also be one half of the primary voltage. As an example: in transformer design, if we have a primary consisting of 550 turns and we impose a potential of 110 volts upon it, we find by dividing the number of turns by the imposed voltage we have five turns per volt. 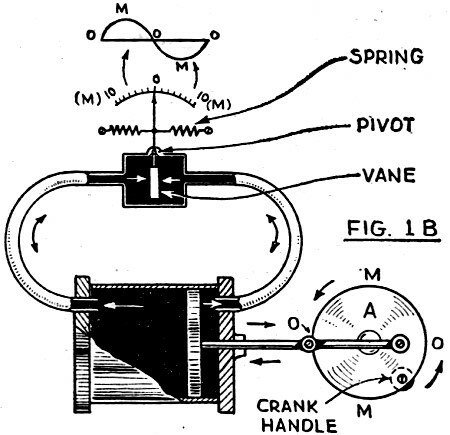 If one would like to obtain a visual picture of the field and action of alternating current when applied to a solenoid a simple experiment can be made by constructing the apparatus shown in Fig. 2C. This consists of a coil having an iron core and beside this core a thin piece of steel is mounted. By fastening a piece of pencil lead to this piece of steel and placing under it a piece of paper, so that the lead comes in contact with the paper as it is moved along, the electrical action can be transferred to the paper by applying 110-volts 60-cycle A.C. to the coil, when the thin strip of steel will vibrate back and forth rapidly. Now as we pull the paper forward at the rate of 1 foot per second we will have approximately 60 complete cycles drawn on the paper, very much similar to those shown in Fig. 1A. A hydraulic analogy of the action of a transformer is illustrated in Fig. 2D, in the form of a hydraulic jack. We have a small pump to the left, which pumps liquid into a large cylinder, forcing the piston of this cylinder upward. The principle is as follows: in the small pump we have high pressure and small quantity which, translated into electrical terms would mean, "high voltage and low current." In the large chamber of the hoist or jack, we have a large quantity and a low pressure. 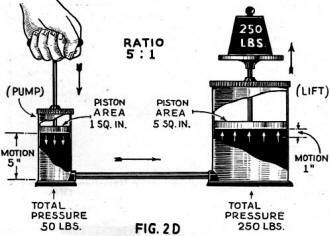 If the ratio between the areas of the two cylinders is 5 to 1 (1 square inch for the pump and 5 square inches for the hoist), then for every 5 inches of movement of the small pump, we have a movement of 1 inch in the large one. The reason one man can lift hundreds of pounds with this hoist is because if we exert a pressure of 50 pounds per square inch upon the small pump, we will have a lifting force equal to the ratio between the two, or 250 pounds, which will be lifted 1 inch for every 5 inches we move the pump at a pressure of 50 pounds. Of course, this would only be true if there were no losses in the action of the pump; however as there is some loss, the pump is less than 100 percent efficient and we find the ratio of power transfer to be slightly less than 5 to 1. This also holds true in the operation of an electrical transformer which usually runs anywhere from 70 percent to 85 percent efficient. The foregoing explanations of alternating current electricity and action of transformers was given in the briefest possible manner in order to acquaint the student with some of the principles involved, so that he may clearly understand some of the actions which will take place in radio circuits to be described later on in this series of lessons. For those seriously interested in the technical side of alternating current electricity we suggest that they read some of the excellent works on this subject. Where E is the voltage, I is the current and R is the resistance of D.C. circuits or A.C. circuits, where the circuit measured is purely resistive, noninductive, and non-capacitive, and the power factor is unity. *Alternating Current Electricity, by Timble and Higbie.